Lisa Sullivan created TerraSoul as way to hold space for others in a practice that facilitates a flow experience, where the participant is immersed, focused, energized, and happy. These practices take the form of Vinyasa Yoga, Kids Yoga, Aerial Yoga, Yoga-Hikes, and Retreats, and boil down to a goal of facilitating holistic self care through nature and play. Lisa is a certified yoga instructor with the Yoga Alliance, a certified hiking guide and outdoor leader with the Interpretive Guides Association and the Outdoor Council of Canada, an Earth Scientists, Registered Consulting Arborist, and wellness enthusiast. 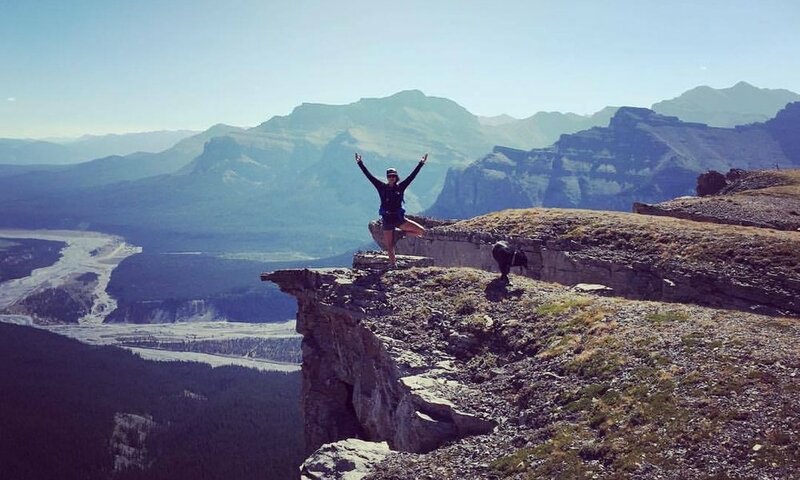 Born and raised in Calgary, AB, Lisa and has spent most weekends in the nearby mountains with her friends and family hiking, biking, climbing, camping, backpacking, downhill and xc- skiing, and snowboarding. Lisa was drawn to yoga in 2010 and has kept up her personal practice since. Always surrounded by nature she has worked as an arborist since 2008, but has been recently drawn to share her passion for Adventure, Yoga, and Play. Yoga, Adventure, and Play create space in the mind and body that can be harnessed as a catalyst to a feeling of oneness and a realization of purpose, making these fun lighthearted activities enriching and impactive on a deeper level. Lisa did her Yoga Teacher Training in 2012 as an exercise in self care and personal growth, teaching casually after having her daughter Pepper in 2013. In order to treat back pain that persisted through and after childbirth Lisa took up aerial yoga but ended up loving it for the sense of play and freedom, much like that of spending time in nature. Lisa began teaching Aerial Yoga unofficially to friends and family, finally taking an Aerial Yoga Teacher Training in 2017. Lisa’s Aim is to create and hold space for others where they can benefit from these practices. Our mission is to facilitate holistic self care through nature and play. Through lighthearted play and adventure we access new space within ourselves and are better able to make connections within ourselves, our community, and nature. We aim to provide the setting and support for wellness retreats that inject your life with a little bit of adventure, some awe inspiring time in nature, and space for self reflection. Find out about our upcoming retreats and yoga classes. Keep up with us, our adventures, and what we learn from them!